This is my last project for the Flying Unicorn Your Passion Your Art August kit. 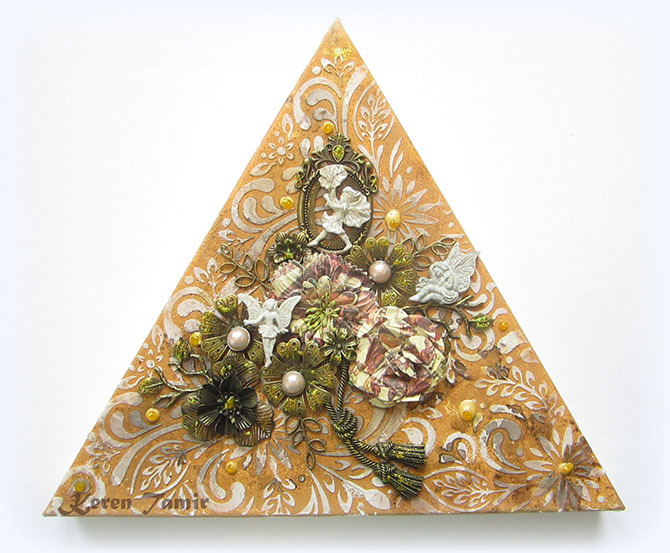 This Triangular Canvas is part of the Mixed Media Art Kit and I’ve designed a home decor piece with it. I painted the canvas with golden brown Prima’s chalkboard paint and then created a pattern on the background. I used lots of Flying Unicorn embellishments and some Prima flowers. I also added some resin fairies as the canvas reminded me of a garden. Its a wrap for the Flying Unicorn August Kit!! Stay tuned for the September one!! Huge Giveaway!! Big Big Big!! Such a beautiful canvas Keren! Loving the pattern on the background! Wow, this looks totally amazing and such a great shape for a canvas, love it, – a lot!! WOW this is so stunning-love the background texture especially ! WOW!!! Very beatiful…..I love this details. Keren, this is absolutely lovely! Your color choices are perfect and this stencil really pops! Beautiful ! Love it. Love the golden hues you created. I simply want to tell you that I’m very new to blogging and absolutely liked this blog. Probably I’m planning to bookmark your blog . You certainly come with great articles and reviews. Thanks a lot for sharing your web page. Just wish to say your article is as amazing. The clearness in your post is simply nice and i could assume you’re an expert on this subject. Well with your permission allow me to grab your feed to keep up to date with forthcoming post. Thanks a million and please carry on the gratifying work. dOKPvf Im thankful for the article post.Much thanks again. interest. I will bookmark your blog and keep checking for new information about once a week.